Posted in Misc and tagged Ireland, names, Pretentious at 12:27 pm on February 28, 2019 by Bodger. Jack. The perfect name for parents without an ounce of imagination. What was 5th on the boys list in 2017, that’s no longer on the Top 20 list? I just looked at the CSO link. Sean was 5th in 2017, and is now at 74th!! What a drop. I wonder what the reason for the sudden unpopularity is? Do we know any Sean’s who became in/famous in 2017/18? Couple of good Tan names in there. Are we all Yanks and West-Brits now? 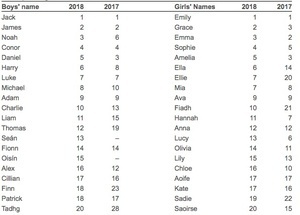 Also worth mentioning that the most popular surname of the 2018 babies was Murphy. Wondering how many named Francis will be around in the next while after auld popey visited us. Sure there were a whole generation named after the holy fella after his arrival…. Deffo going to call any next child Skynet now. Theo! The Life and Death of Colonel Blimp was on the tele on Saturday. A cracking film which I hadn’t seen in ages. I must give it another look – again it’s been a long time. It was famously panned by the English press and the re-edited (or butchered) for its US release, only to be rehabilitated in the 70s as one of the greatest English films ever made. My own memory of it is hazy, whereas I could almost quote the lines from Blimp before they were spoken. Classic powell and presburger. A matter of life and death needs a re-release. battle of the river plate is also a worthy gawk. Still only one Cu Chulainn..
Not Mohammed as Gemma/Ian O’Doherty would want us to believe.